Growing up, I was home-schooled from about first grade until graduation. If you were to ask me today what I thought of being home-schooled, I would tell you that I loved every minute of it (well, there were a few moments I didn't enjoy but overall, it was a wonderful experience). My mother had her hands full but did an amazing job teaching her six children. All of us made it to graduation and most of us have either graduated college or are on the brink of graduation college. We did well and could not have done it without a mom who truly loved us enough to sacrifice her time to teach us. So, it is no wonder that I plan on homeschooling my children. My oldest child, Hannah, just turned 4 and she is one smart 4 year old. From the time she was able to sit up, she was so inquisitive and loved books, blocks and anything that kept her mind busy. I have really been looking forward to starting school with her. Michelle Vallene, the President and founder of Learners Lane and the author of “What Children Need to Learn to Read”, is also a busy parent with three children. She currently teaches reading and math at an elementary school in Redmond, WA. She believes strongly in the impact that education, teachers, and parents have on the future. She continues to develop products and services that make the world a better place, one child at a time. 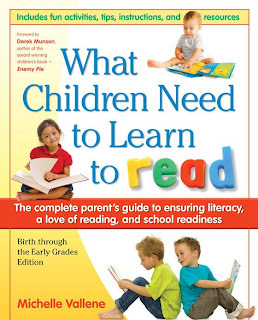 So, for this review I received the "What Children Need to Learn to Read" book and I was very excited to read through and see what Michelle's tips are. Not only do I have a 4 year old, I also have a 2 year old who hates to be left out of anything. When I am teaching Hannah Pre-K, Jacob is usually right next to me looking for things to do too. Even if I just give him a piece of paper and a pen, he is content to be a little scribbler. Jacob is also not talking clearly and I have heard that reading to children can really improve their speech skills. So, we real LOADS of books. That is what this book is all about. It teaches you, as a parent, how to effectively create a solid foundation for your child's reading skills. You know where it all starts? When your child is an infant. Michelle's book focuses on children ages birth through the early grades so it is never too early to start teaching reading skills. It is important to not worry about whether they can understand the words...explain the pictures, use voice inflections, and be expressive. Another way Michelle teaches parents how to work with their children is to use hands-on projects. Kids do a ton of learning with their hands and touch is very effective when it comes to learning. In "What Children Need to Learn to Read", there are a whole bunch of ideas on how you can teach your child their letters and numbers. My favorite is the one pictured above...using shaving cream. It lets the child use their hands, and allows you to instruct in a way that will hold their attention. This book also contains a plethora of helpful information including check lists, age-appropriate tips, techniques and activities to keep your little ones busy throughout the day. I find some days I really need extra activities to keep my children occupied and this book would solve a lot of our boredom problems. "What Children Need to Learn to Read" comes with a music CD that has rhymes poems and songs for children to sing along with. Honestly, I didn't care for the CD. The music really got on my nerves as the music accompaniment was mainly tom-tom-type drum music. It just wasn't my style and I found it rather boring. "What Children Need to Learn to Read" is available for purchase from Amazon for $14.95. You can also order it through Learners Lane. So, in my opinion...I LOVE this book! "What Children Need to Learn to Read" is very well-written and very easy to understand. No matter how young your child is, they can learn the foundational skills needed to read and write and this book will help you teach them how! I find it very practical and also very fun for the children. I am not naturally a creative person so I NEED this book. Disclaimer: I received no monetary compensation for this post. I did receive a free book for review purposes. All quotes and stock photos are from the Learners Lane website and email. Prize is being provided and shipped by the sponsor. All thoughts and opinions are 100% mine. My grandson just turned five and started kindergarten this year, he so badly wants to know how to read! This company came to be with two women together in a living room searching for a way to teach a child how to read. Leave it to a devoted Mom! They have a lot of great downloads - will have to check them out for teaching at home! I like the interactive activity ideas! Clapping teaches counting...never really thought about it. i like the downloads of sight words. I like how she recognizes how much we are already doing right and giving more helpful ideas for the future. I like the reader books. My daughter just started kindergarten and is learning to read. We need some books that she can read to me! I like the easy reader books. I can use our everyday schedule to work in learning lessons. In the car, at the store, etc. Another product I'd like is the Mental Math Game – 7 ATE 9, I had trouble with math so I want my kids to do better! I learned that clapping teaches rhythm and counting and I like the Aba-Conondrum game. Word and Story Game – Rory’s Story Cubes - this looks interesting. Learn to Read"By Michelle Vallene. Visit Learners Lane.com and tell you something interesting or fun i learned/saw there! I love the large variety of products they have especially the math games! I know my daughter would like their songs and stories, I like the creative ideas! Thanks! In “doing” activities they love, children learn naturally and easily. I didn't realize clapping did so much!